Are you ready for the ghosties and goulies? 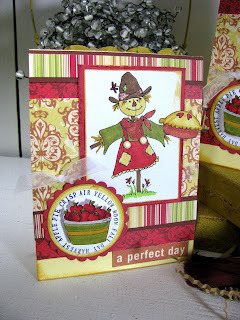 This month got away from me without posting hardly ANY Halloween cards! 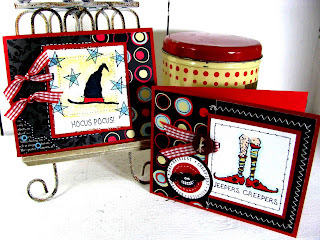 So one last ditch set of cards here, done with Anna Wight's Whippersnapper "Hocus Pocus" stamp set. I HAD to play because I LOVE this witchie's hairy legs! I had visions of using this non-traditional red, yellow and blue American Crafts Metropolitan "Discotech" paper for lots of Halloween cards, but only was able to get 2 of them done! WELL BOO!! 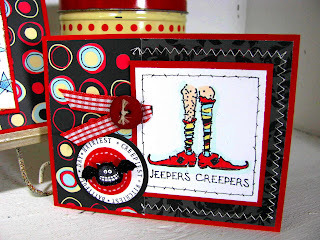 I drew in a little barbed wire border to coordinate with the witchie's little 'barbed wire' legs. I also used my Justrite 1 5/8" harmony stamper for the ring around the bat. The bat is glittered up with Martha Stewart Onyx glitter. Hope you have a fun Halloween; it's the scariest, hairiest, witchiest, battiest night of the year! Enjoy! Hiya & HAPPY THURSDAY! 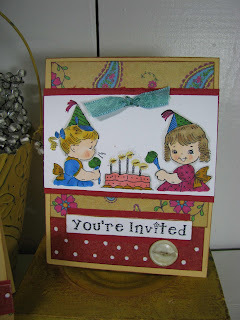 After what feels like FOREVER, I'm finally back blogging & stamping again! I'm so excited that I have today off; I've been running around like a chicken this last week, prepping for the Duluth Crop-for-a-Cure that I'll be teaching at this coming weekend. I finally have all of my class kits made up, have all supplies and samples packed, and am ready to GIT R DONE! 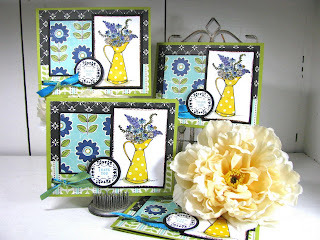 I had a brief moment last Saturday to stamp for fun, and put together these Flourishes cards, using their "Summer on the Patio" stamp set. I LOVE this cute bucket of flowers! 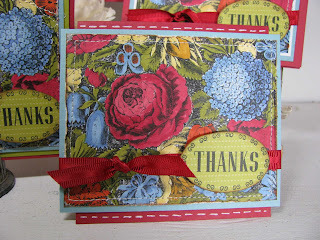 I need thank you cards in the worst way! I also learned a GREAT new trick from friend Carol Halvorson; she taught me to make my photos brighter by using the 'contrast' button on my photo editing software! I think this solves my DARK photo issues! YIPPIE! I now LOVE my Canon camera! 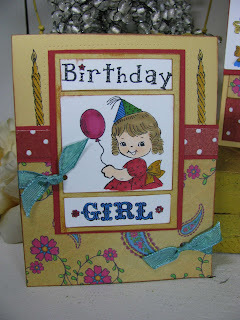 I also recently got a Just-Rite mini round 1 3/16" Luxe stamper kit, and was able to play with it for sentiments. It comes with some really cool flourishy round monograms. I need to make me some MONOGRAM cards soon! Supplies: Flourishes Summer on the Patio set, Just Rite 1 3/16 round stamper, October Afternoon "Hometown" paper pack, Copic Markers hydrangea blue, golden yellow, pale olive, Ultramarine, Ice Ocean, Putty, Milky White. Hi all! 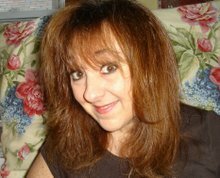 I can finally spill the beans tonite, to let you know why I've been a slacker-blogger lately! 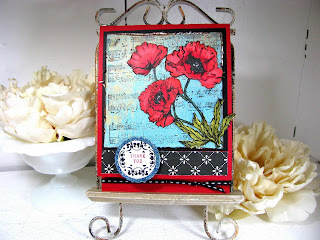 I was asked to be on the Dirty Dozen design team at Splitcoaststampers, so I will be sharing my creations in the dirty dozen gallery for the next 6 months! For those of you unfamiliar with Splitcoast, they have a special hidden gallery that you can subscribe to, where you have access to new ROCKSTAR stampers every month! Hopefully everyone can be patient with me & the blog, as I'm freaking out a little bit, wondering how I'm going to handle a blog, the dirty dozen team, Crafty Secrets, a full-time job, and a BOWLING LEAGUE?! I'll git-r-done, it's just a bit overwhelming right now! 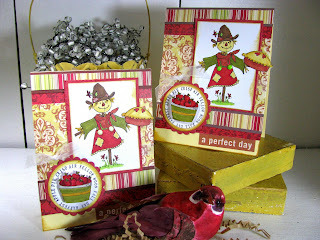 The other new addition to the dirty girls team this month is Jessie Rone, whose incredible creations grace her blog HERE! So on to tonite's cards. I was at Michaels last month and happened to catch my local store clearancing out a bunch of Anna Griffin stamps. 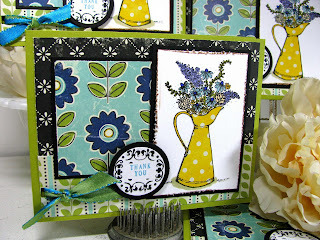 I actually paid only $2.50 for this floral stamp that fills almost the entire front of the cards that I'm posting tonite! I stamped them off with Brilliance Black ink, heat set it, and then set about coloring the flowers my Copic markers, shading in the dark areas, like I did with the Flourishes Peony tutorial I did HERE. 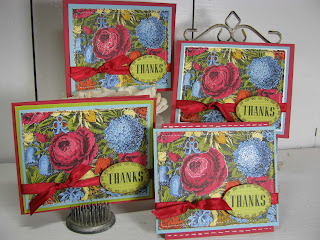 The oval "thanks" was done with a Justrite Oval stamp (brayton font) on some striped green patterned paper scraps I had in my scrap bin. We finally closed the cabin last weekend, so I'm looking forward to being home now and settling into fall and stamping season! Oh and one more thing; I wanted to tell everyone thank you for always supporting me and for leaving such kind comments for me. It is truly what keeps me going! 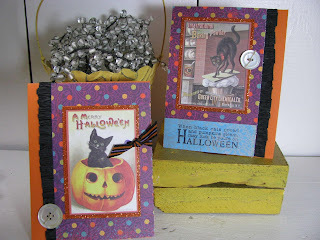 YET more Halloween cards using Crafty's Halloween booklet. QUICK AND EASY! I need quick and easy in my life right about now! 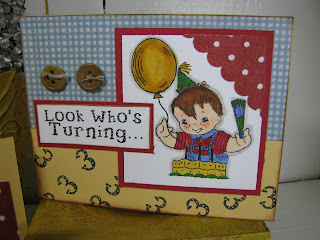 I started designing cards a few weekends ago at the cabin for my work stash of cards, and finally cracked open this Crafty Secrets Birthday Kids stamp set! Dang, these kids are so fun to color! I really haven't even cracked the surface of the stuff that can be done with this set...Sandy designed the kids' hands so they can hold a bunch of different items from the stamp set. 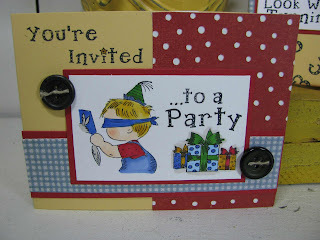 They included fun accessories like balloons, party favors & horns that each child can hold! Here I created a triple pane for the main image...I want to play with this layout a little more because I like the 2 skinny strips sandwiching the main image here. I also love that they made little "blow marks" to place in front of the kids' mouths or coming out of the horns, so it looks like they are in motion (or spitting!) ! I colored around the edges of the candles so it looks like there is a warm glow around the flames. Hiya! 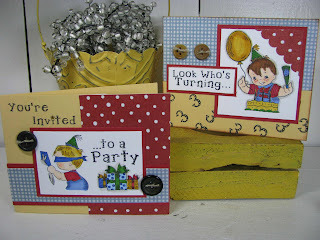 It's slacker-blogger here, finally showing cards I made a few weeks ago! 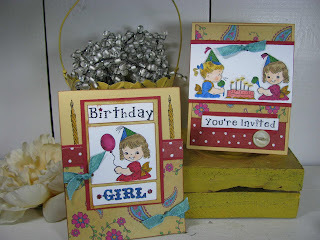 I made birthday cards for the birthday girls when we did the junking trip. This one was for my Auntie Jan, who has 2 fat cats named Thema and Louise. Or "WHEEZY" as Aunt Jan calls her. I thought this party cat would be a perfect way to celebrate her birthday! 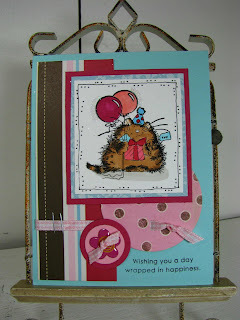 The kitty is from a Penny Black Acrylic set called "Bubbly" that I got from Eclectic Paperie. 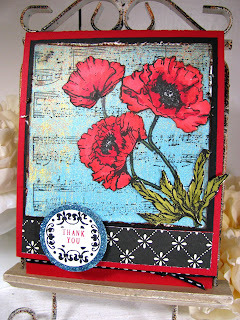 These little Penny Black guys are my favorites to color.